Ireland is a magical place full of striking landscapes, beautiful coastline, and the nicest people we’ve met anywhere in the world. There’s a reason it’s on so many people’s bucket lists. During our first Ireland trip, we hadn’t even left before we began talking about when we could return to see other parts of the country plus Northern Ireland, too. We finally had the opportunity to make our 11-day trip to the Emerald Isle a reality. 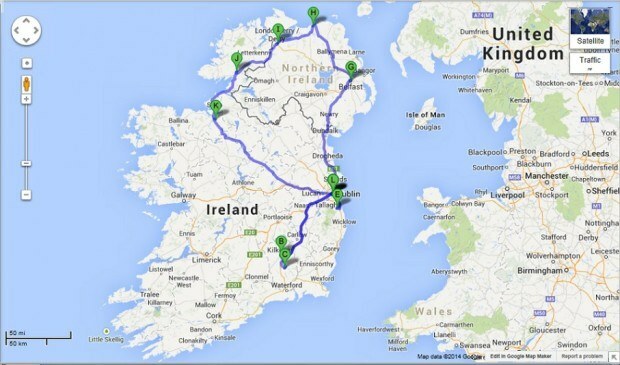 Here’s our Northern Ireland and Ireland road trip itinerary to help you plan your travels. An important note for drivers: a good GPS that allows you to input coordinates will go a long way with this route. 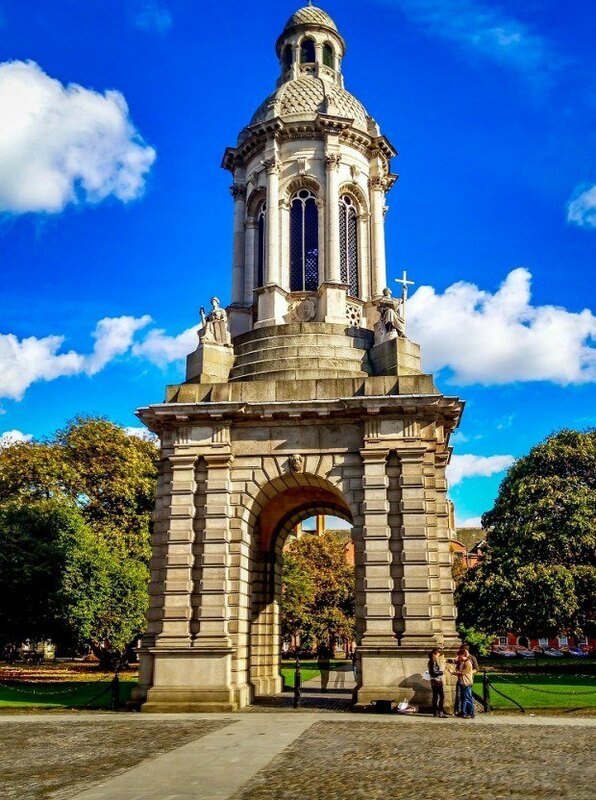 Arriving in Dublin, we immediately rented a car to head around Dublin on the M50 beltway and then the R115 (the Old Military Road) up over Sally Gap and into the Wicklow Mountains in the direction of Kilkenny. The landscape in this part of the country is beautiful, as you pass mountain streams and wind through patches of forest and up and down the undulating hills. Everything is just so green. We stopped in the mountains to explore the Celtic ruins in the Irish countryside. 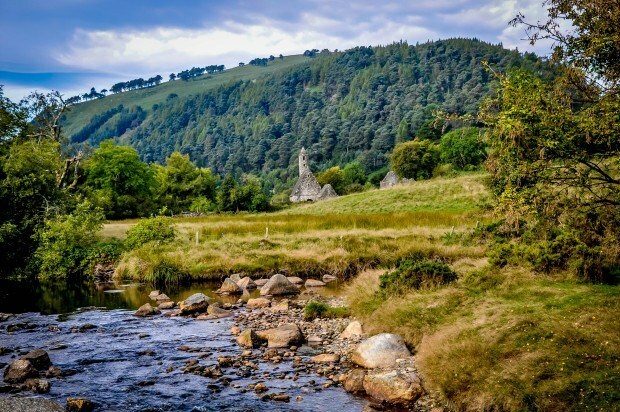 Glendalough, known for its round tower, was a monastic settlement founded in the 6th century. Although it is a popular place, we were nearly alone as we explored the grounds of Glendalough, marveling at its old tombstones and Celtic crosses. Our next stop was Baltinglass Abbey, a 12th century ruin which was once one of the richest churches in Europe. The first night was in the medieval city of Kilkenny at the Alcantra B&B. Our Irish road trip continued as we headed out on the scenic R697 to the Priory of Kells. 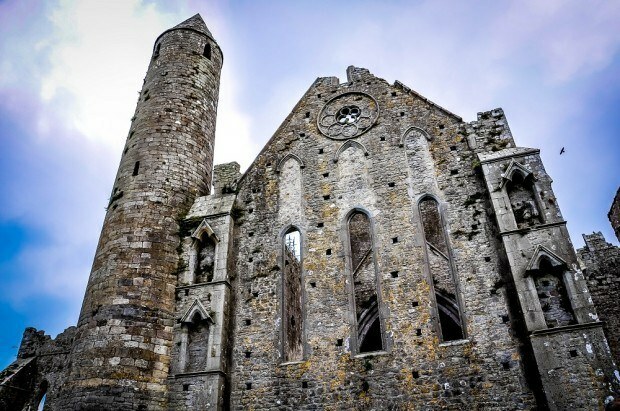 The 12th-century ruin—one of our favorites—was the largest and most important Augustinian monastic site in Ireland. Currently undergoing restoration, it’s a magnificent sight to see. After a stop at Knockdrinna cheese shop in Stoneyford to pick up a picnic, we were off to our next destination on our Ireland itinerary. We took the picnic over to Jerpoint Abbey, eating under the majestic tower. In the afternoon, our destination was the Rock of Cashel. We took the scenic drive R691 over to the ancient hilltop site where we walked the grounds for about an hour, seeing the Round Tower, the Romanesque Chapel, and other important ruins along the way. In the afternoon, we took the M8 back to Dublin. 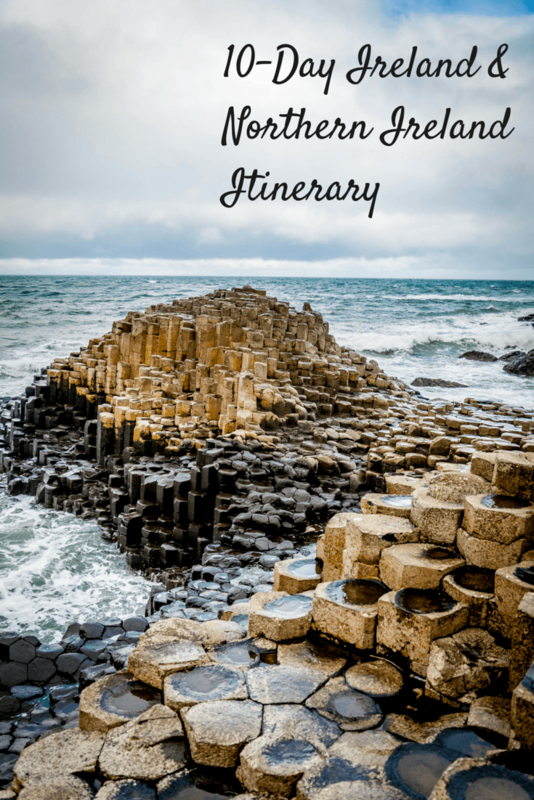 With two tours and a an awesome dinner show, we squeezed every moment out of the third day of our Ireland travel itinerary. The day began with a walking tour of some cool, unexpected sights in Dublin with Le Cool Dublin. The beauty of this tour is that it changes every time. Its goal is to show visitors what’s hip and now in the city, so you may meet artists, visit markets, and see street art like we did, or you may see something completely different. A Le Cool tour is an awesome way to experience the city. In the evening, we finished up our day of walking with entertainment. The Dublin House Party is a unique combination of a hearty Irish dinner and a show featuring some of the best Irish musicians and dancers in the city. What could be a cheesy experience is instead very well-done, showing visitors the importance of Irish music and the fun that goes along with it. The Dublin House Party is great for couples and families. Our day began at the peaceful Powerscourt Estate and Gardens. 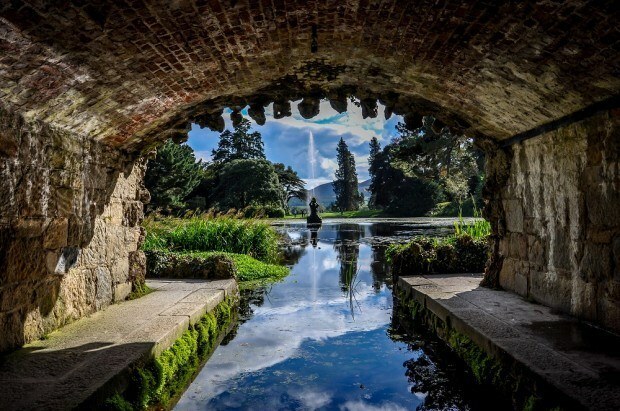 About an hour south of Dublin, the sprawling estate is a brilliant place to enjoy nature. It tops National Geographic’s list of the world’s best gardens. 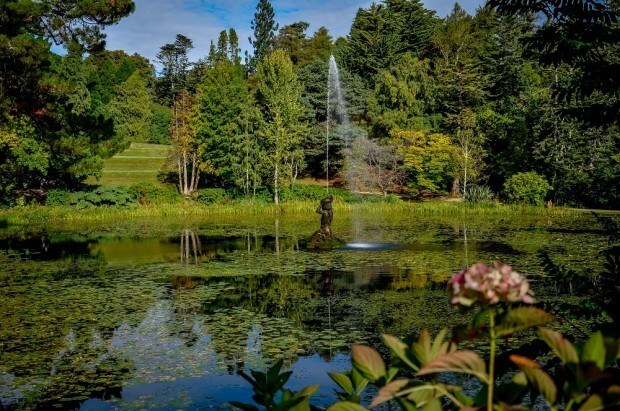 Punctuated by fountains, ponds, and an endless number of trees and flowers, the 47 acres of gardens at Powerscourt are a lovely place to wander. Amidst a setting of 200-year-old trees, you’ll even find Ireland’s highest waterfall. In the afternoon, we returned to Dublin to imbibe at The Jameson Distillery Bow St. and the Guinness Storehouse…because that’s what you do in Ireland. 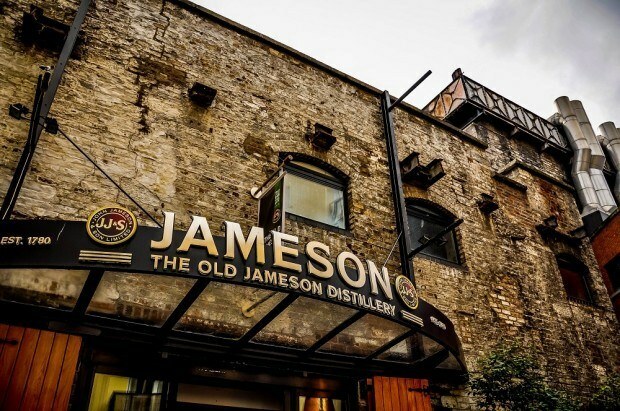 At Jameson Distillery, begun on Bow Street in 1780, we got a sense for the history of the place and what was required when John Jameson started distilling here over 200 years ago. It was a great crash course in making one of the whiskeys that Ireland is so famous for. Plus, we got to do a comparative tasting of their wares. The Guinness Storehouse is the most popular tourist attraction in Dublin for good reason. This seven-floor experience takes you through all the steps of brewing Ireland’s iconic dark beer. We saw displays about all of its ingredients and the history of the beverage, culminating in the opportunity to pour our own pint on the top floor, which has a great view over the city. 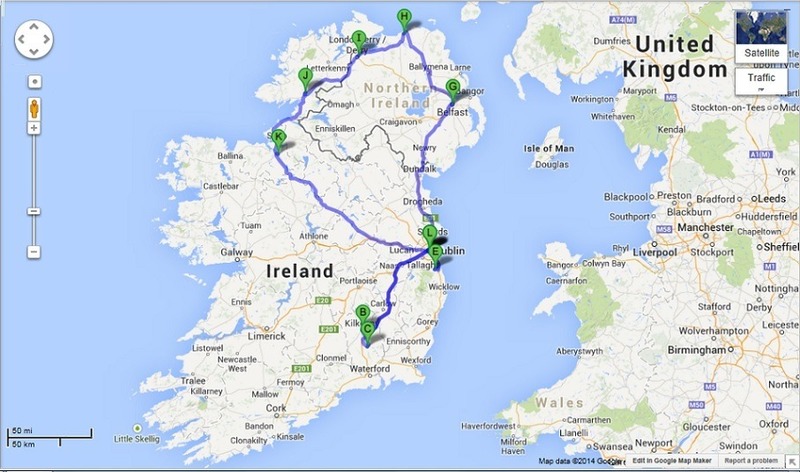 We woke up early and set out driving from Dublin to Belfast on the M1. As soon as we arrived in Northern Ireland, we got busy sightseeing. It was lunch time, so it was a perfect excuse for one of our favorite activities–visiting local markets around the world. 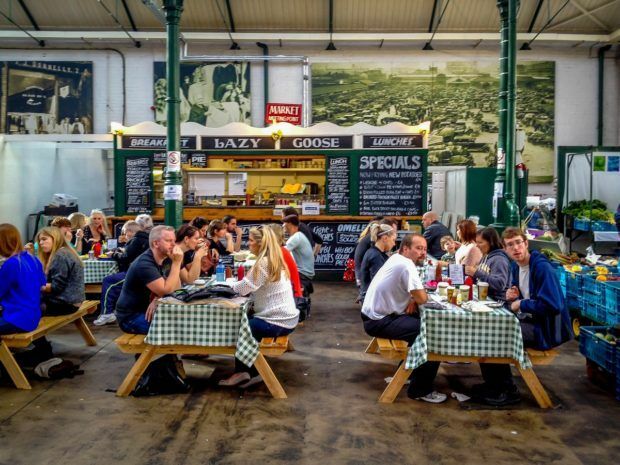 St. George’s Market in Belfast has operated at the same site for an incredible 400 years. 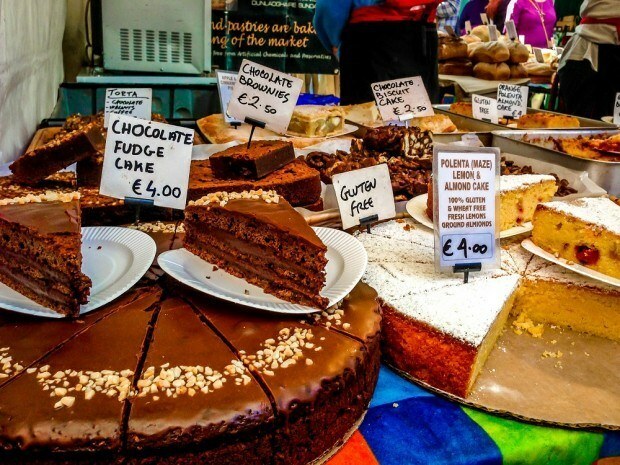 One of Belfast’s oldest attractions, St. George’s showcases the best in Northern Irish products. From food stands to fresh produce, the market has a little bit of everything delicious with a heavy dose of national pride thrown in. The second stop on our Northern Ireland trip was Titanic Belfast. 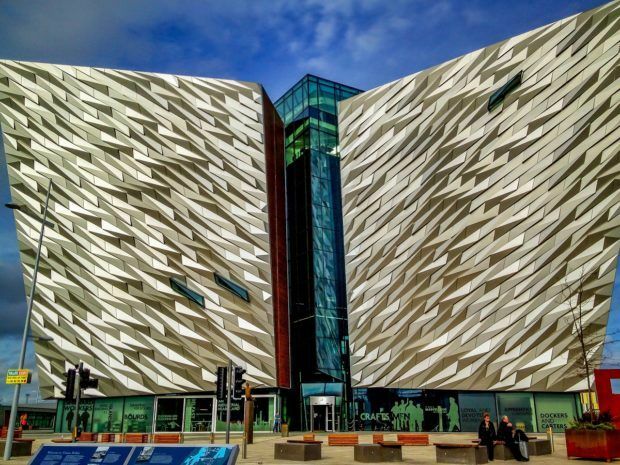 The leading tourist attraction in the world, the Titanic Museum tells the story of the ill-fated ship on the site of the former Harland & Wolff shipyard (its builder). The fascinating museum has exhibits about the building and launch of the Titanic as well as vivid accounts of its sinking and the aftermath of the disaster. Day six began with our highly-anticipated Black Cab Tour of the Troubles murals of Belfast with Paddy Campbell. 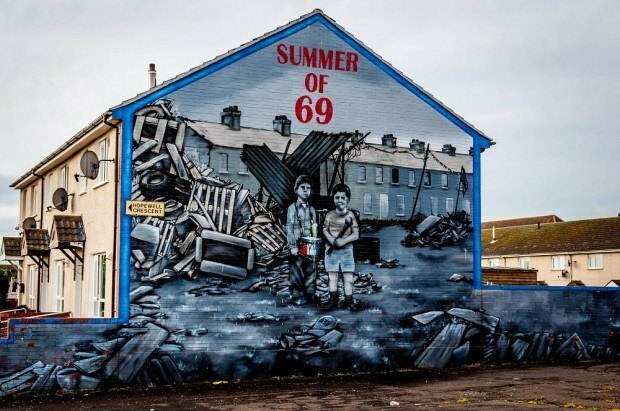 Driving along the Shankill Road and other areas of Belfast, we saw mural after mural commemorating historical figures and participants in the decades of conflict that ripped apart communities in Northern Ireland. Paddy presented an unbiased look at the issues on both sides–the mostly Protestant Unionists who wanted Northern Ireland to remain part of the United Kingdom, and the mostly Catholic Republicans who wanted Northern Ireland to become part of a united Ireland–which is a hard thing to do in a place that was as politically charged as Belfast. At the end, we got to guess his affiliation. We guessed wrong. We couldn’t recommend this eye-opening tour more. After lunch, we left Belfast headed north on the M2/A26 in the general direction of the Antrim Coast. 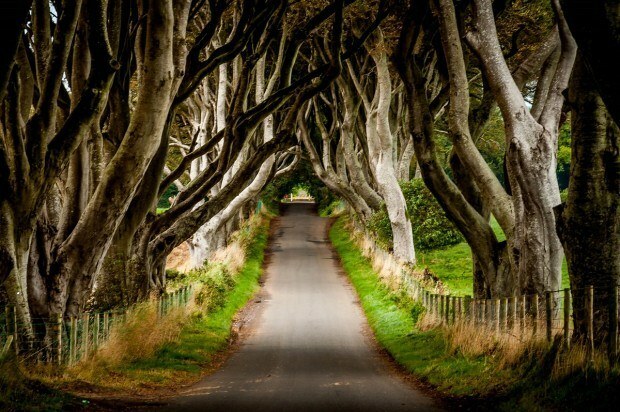 We took a brief detour to the Dark Hedges to take some photos in this spot made famous thanks to its haunting beauty and its cameo as the Kings Road in the Game of Thrones. We arrived in Portrush for the evening where we spent the night at the Shola Coach House. We left Portrush heading even further north on the Causeway Road to Giant’s Causeway. 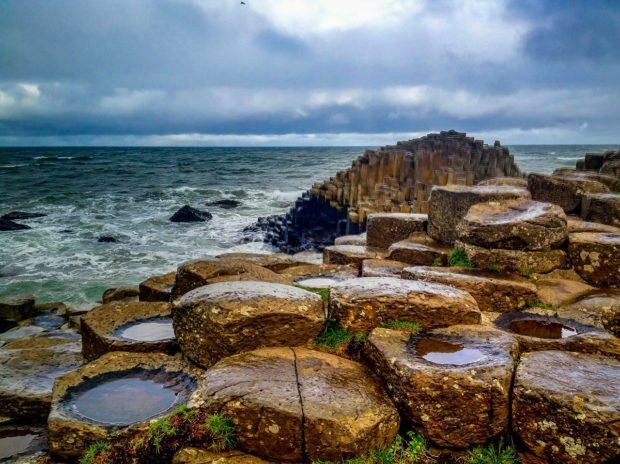 In the drizzle, the spectacular basalt columns of the Causeway took on a moody feeling as we watched the waves crash nearby. We spent at least an hour just climbing up and down the unique formation. 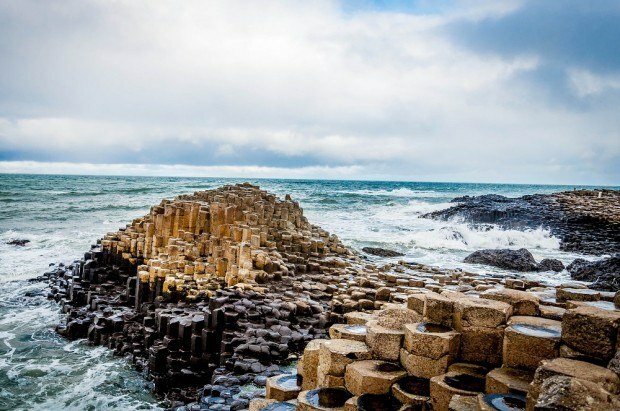 Giant’s Causeway is not to be missed on any trip to Northern Ireland. 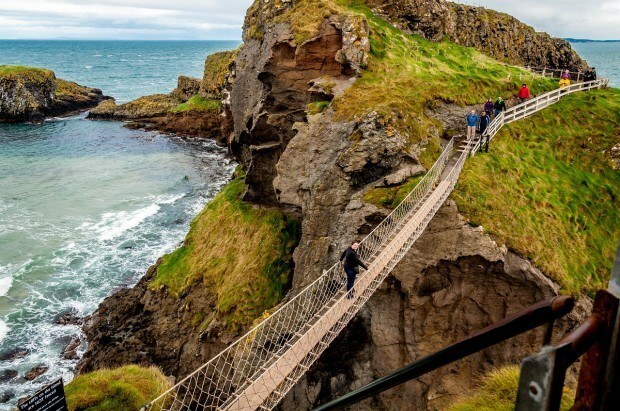 Nearby, we visited the Carrick-a-Rede rope bridge. First erected by salmon fishermen in 1755, the bridge hangs (apparently precariously) between rocky outcroppings in the north Atlantic. Crossing is an adventure and not for the faint-hearted, but if the winds are calm, it’s not as scary as it looks. After spending much of the rainy day outside, we visited The Old Bushmills distillery to warm up in the late afternoon. Unlike Jameson, which we visited in Dublin, Old Bushmills is also a working distillery, so the smell of sweet mash hung in the air as we toured the factory. We saw the whole distillation and bottling process and ended with a perfect hot toddy in their tasting room. It was a long, windy, wet day of amazing sights, culminating at a night at the charming Caw Cottage. 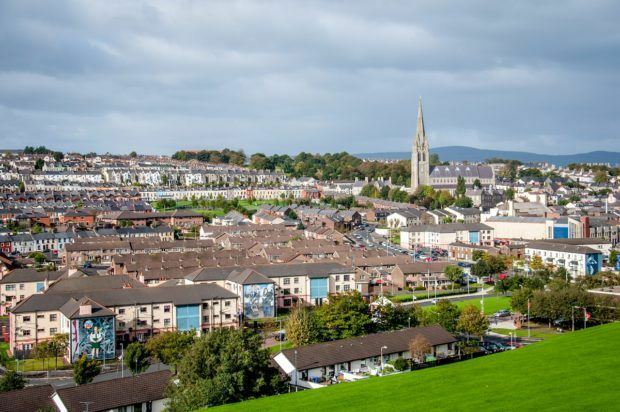 We woke up in Derry and actually stayed there for the full day – one of the only nights on our whole trip that we spent two nights in the same town. We began the day with a rainy but thought-provoking tour of the Troubles Murals of the town. 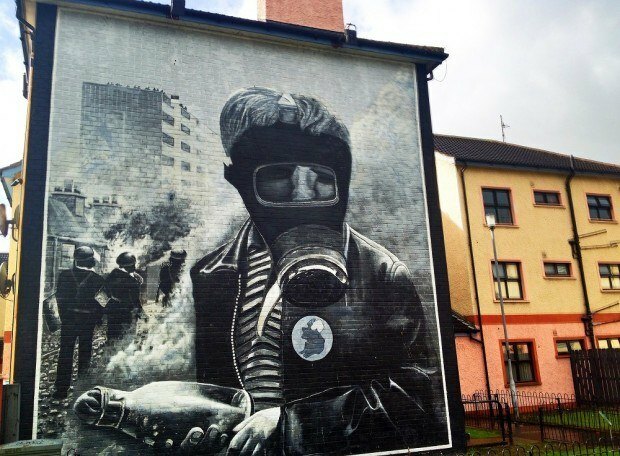 As in Belfast, Derry is filled with murals depicting imagery from both sides of the conflict. There are the Union Jacks of the Unionists and murals showing Republicans alongside civil rights leaders like Martin Luther King Jr.
After seeing the murals, we joined in on a great historical tour of the city which took us by the top sights and allowed us to walk on part of the city’s 17th-century walls. In the evening, we decided it was time for a bit of Irish music and made our way to Peadar O’Donnell’s bar. There are photos from the bar and our other road trip adventures here. Leaving Derry (and beautiful Northern Ireland) on the N13/N56 road, we drove the rugged coast of the Donegal peninsula, part of the Wild Atlantic Way route. Our plan for the day was simply to drive and watch the landscape change, stopping in any village that caught our attention. Along our drive, we encountered massive cliffs plunging into the ocean, small towns with picture-perfect harbors, and miles and miles of countryside turning from green to gold under the early autumn sun. It was absolutely gorgeous. We spent the afternoon and night enjoying the luxurious Lough Eske Castle. 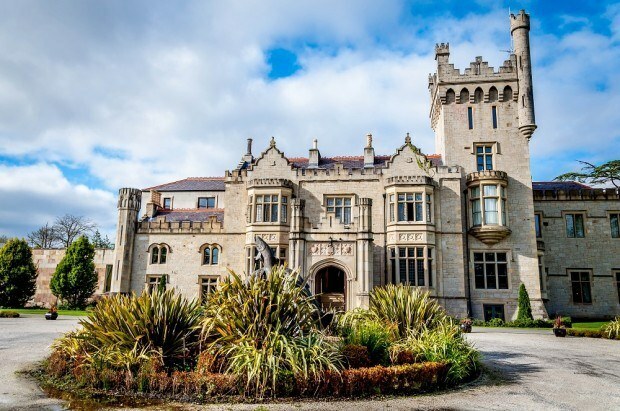 This 5-star castle hotel, which traces its roots back to the 15th century, offers an immersive guest experience with an amazing spa, fabulous restaurant, and packages that include access to local parks and other castles. A night here is the height of luxury. We spent the morning at Lough Eske Castle enjoying the sprawling grounds and their gourmet breakfast. Sooner than we were ready to leave (we would never have been ready), it was time to go again. This time, our destination was Slieve League. 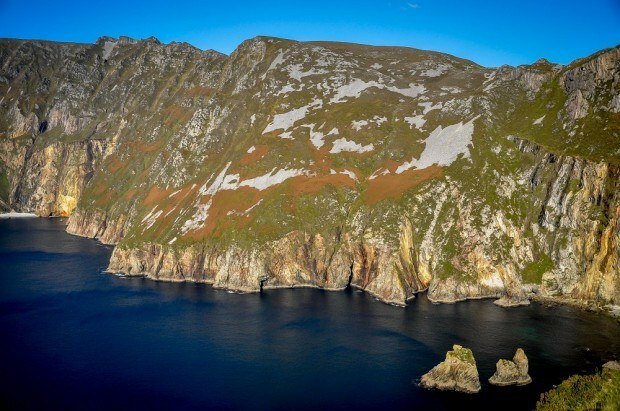 Driving west along the N56/R263 road, we approached the giant cliffs of Slieve League (Sliabh Liag, in Gaelic), which are three times higher than their more well-known cousins at the Cliffs of Moher. 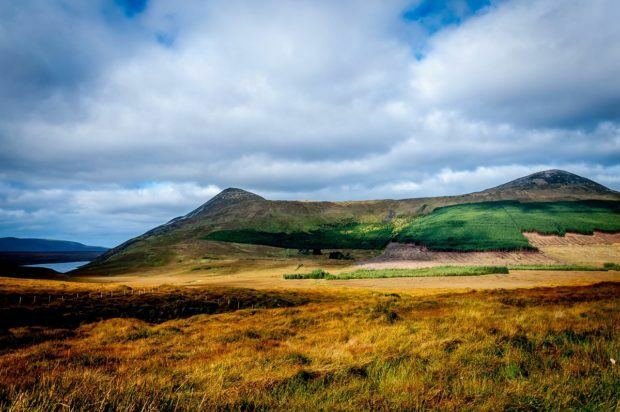 From the top, there are magnificent views of the Atlantic Ocean, the Sligo Mountains, and Donegal Bay. It was a brisk and windy experience on an October day, but one we were glad to have. Another beautiful drive south found us in county Sligo. It was already late afternoon by the time we arrived. 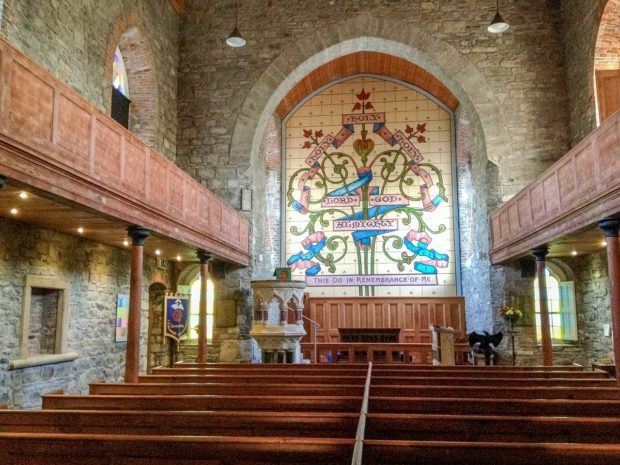 We had planned to visit the ancient Sligo Abbey, but it was under construction, so we went to St. Columba’s Church in nearby Drumcliffe instead. The small church with the bright stained glass is the final resting place of literary giant W.B. Yeats. Markree Castle Hotel, another brilliant, ancient castle, was our home for the night in Sligo. In the morning, we visited Carrowmore, the largest cemetery of megalithic tombs in Ireland. All the monuments here are estimated to be at least 5000 years old, which is mind-blowing. 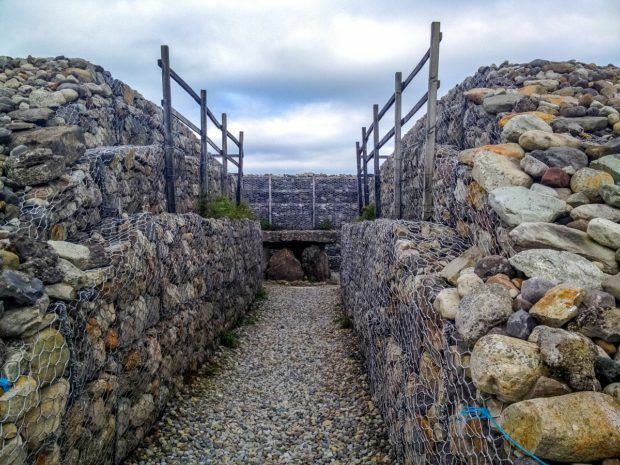 We didn’t find them quite as impressive as the huge megalithic passage tomb at Newgrange, but they are certainly worth a visit if your Ireland travels take you through Sligo. After our visit to Carrowmore, we turned back on the N4 road toward Dublin. We returned the rental car at the airport and spent our final night in the capital. 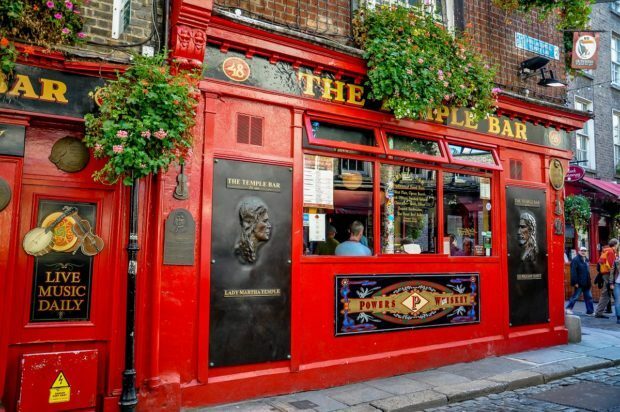 The evening was spent at the Brazen Head, Dublin’s oldest pub, seeing a dinner show about the history, myths, and fairy tales of this beautiful island. Hotels: Ireland is quite challenging in terms of accommodations. Unlike most countries, there are not a large number of big hotels. Instead, Ireland is full of a small, boutique hotels and B&Bs. We recommend looking at Booking.com for hotels, inns and B&Bs. Rental Car: We recommend renting cars from brand name, larger international companies, or a comparison site like Auto Europe, which is known for its service. If you have a problem, they tend to be more reliable. 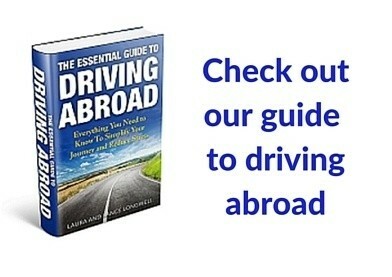 Before you go, we recommend getting a copy of our book, The Essential Guide to Driving Abroad, which demystifies and simplifies the process of renting overseas. 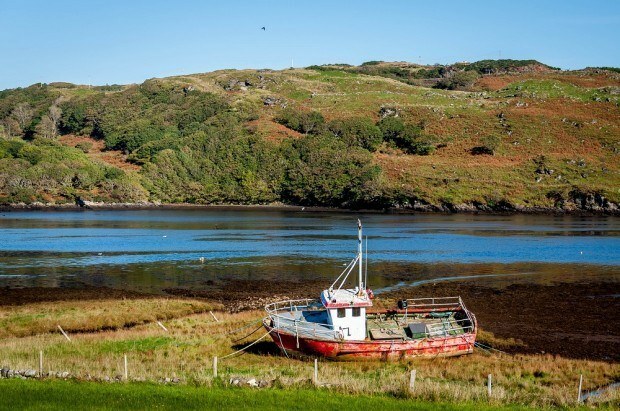 Travel Insurance: Ireland is an amazing destination! While the country is extremely safe, car accidents are common. For this trip, we bought travel insurance from Travel Guard, which can provide you with coverage for unexpected medical expenses while on a trip because you never know what can happen. 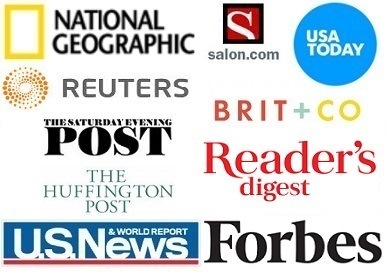 Booking through these sites may earn us a few pennies, at no additional cost to you.